MercyMe (not pictured: Robby Shaffer) with longtime agent Mike Snider. 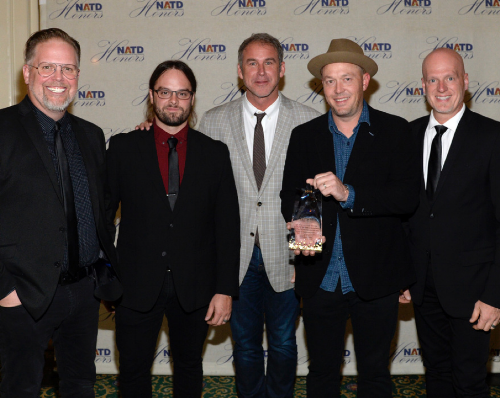 Nashville, Tenn. (Nov. 8, 2018) – MercyMe was among the honorees in their hometown of Nashville at last night’s NATD (Nashville Association of Talent Directors) Honors. MercyMe’s longtime WME Agent Mike Snider presented the honor to the multi-platinum selling band alongside a presentation video encompassing the music, tours and awards of their multi-faceted career thus far. Among the other honorees include Country Music Hall of Fame member and Grand Ole Opry star Bill Anderson, legendary CAA agent Stan Barnett, Variety Attractions’ George Moffett, President & CEO of TPAC Kathleen O’Brien and legendary APA agent Ray Shelide. The event, presented by Creative Artists Agency (CAA) and the Grand Ole Opry, featured Nashville’s best of the best in the entertainment industry to present and show respect to the honorees. Top Row: Honorees MercyMe band members Barry Graul, Bart Millard, Michael John Scheuchzer and Nathan Cochran. MercyMe will wrap their 2018 “MercyMe Imagine Nation Tour” this weekend. The 2019 run will kick off in early March. For the latest information, stay tuned to www.MercyMe.org. The Nashville Association of Talent Directors (NATD) was founded in 1958 and professionally represents, directs, and promotes the entertainment industry through its members. Today those members generate over $300 million dollars annually for Nashville-based artists. The organization not only serves as a forum for idea exchange among its members, it also serves as a vehicle for other facets of the industry to share information vital to the overall growth of the Nashville music and entertainment industry. NATD members foster camaraderie among "friendly competitors" which seems to be unique to the close-knit Nashville music and entertainment community. As part of its philanthropic program NATD provides scholarship funds for students showing exemplary performances in academics, civic duties, and personal goals. For more information, please visit www.nashvilletalentdirectors.com. It continues to be a landmark year for the multi-platinum selling MercyMe. A major motion picture based on the life of frontman Bart Millard who wrote the mega-hit song "I Can Only Imagine” after the loss of his father opened at a remarkable No. 3 at the box office on Mar. 16, 2018 (Lionsgate, Roadside Attractions). Carrying the same name, Millard’s first memoir also released this year followed by the unveiling of I Can Only Imagine – The Very Best Of MercyMe. MercyMe was recently named Top Christian Artist at the 2018 Billboard Music Awards, was the top winner at the fan-fueled K-LOVE Fan Awards including a win for Artist of the Year and garnered a seventh AMA nod. The group was the 2017 GMA Dove Award Winner for Artist Of The Year. Since their debut in 2001, GRAMMY® nominated, multiple American Music Award and Dove Award winners MercyMe have sold more than 9 million units in CD, single and DVD sales, garnered more than 58 No. 1 multi-format radio singles and four consecutive mainstream radio hits with “I Can Only Imagine,” (No. 4 AC/Top 25 on Top 40/Hot AC), “Here With Me” (No. 4 AC), “Homesick” (Top 10 AC) and “So Long Self.” MercyMe made history in 2014 as “I Can Only Imagine” surpassed 2 million digital downloads, making it the first song in Christian music to go platinum and double-platinum in the digital domain. The album containing the hit, Almost There, recently received triple platinum certification from the RIAA. In 2009, Billboard named MercyMe's "Word Of God Speak" the No. 1 Song of The Decade and the group the No. 1 Artist of the Decade in both the Christian Songs and Christian AC Songs categories, recognizing them as one of the industry's most notable talents. They have sold out venues throughout the US and Canada, including Radio City Music Hall, and have appeared on the Macy’s Thanksgiving Day Parade, The Today Show, CBS This Morning, FOX New Channel's FOX & Friends, CNN, ABC News and in the pages of Entertainment Weekly, The New York Times, USA Today and more. MercyMe’s eighth studio album, the RIAA Certified Gold Welcome To The New, garnered two GRAMMY® nods and four radio hits. LIFER, their latest chart-topping, GMA Dove Award winning and GRAMMY® nominated album, includes the RIAA certified gold, GRAMMY® nominated smash hit "Even If” which dominated the Billboard and Mediabase radio charts with a 19-week streak at No. 1. I Can Only Imagine - The Very Best Of MercyMe is available at Apple Music, Spotify, Amazon and iTunes.